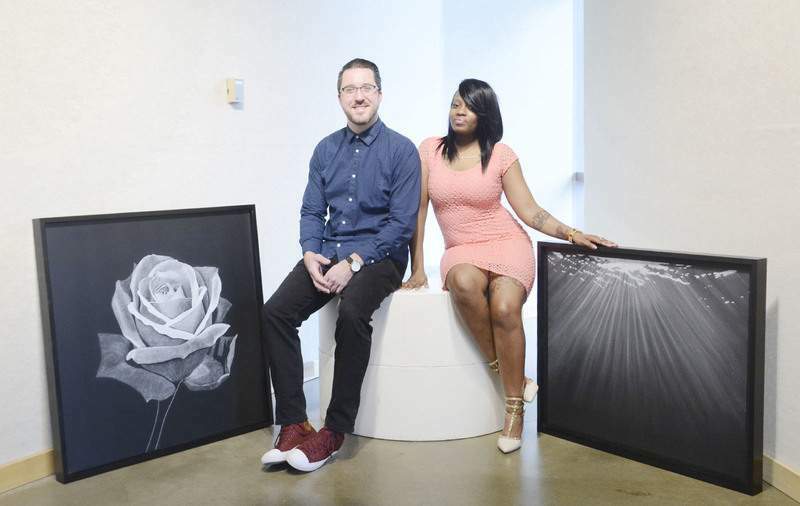 Samuel Hoffman | The Journal Gazette Jared Applegate worked with Kertina McCoy to create “Dear Aunt Rose,” left, and “Cleansin” for the art exhibit. 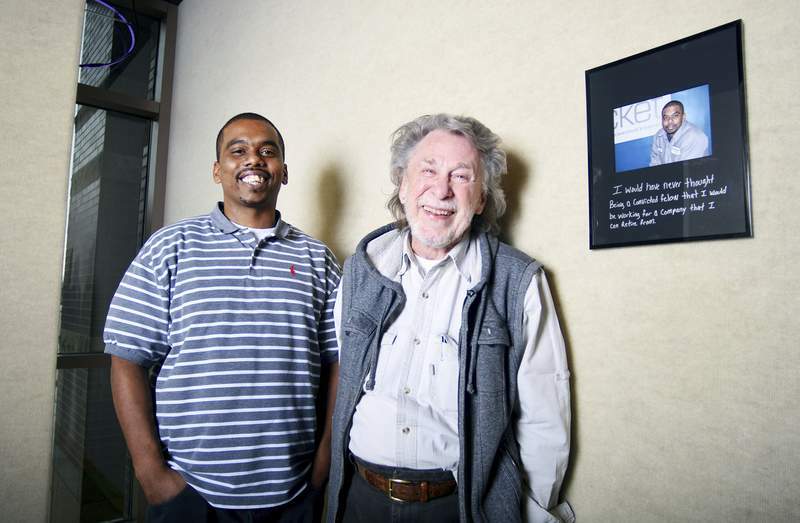 Rachel Von | The Journal Gazette Photographer Stephen Perfect, right, partnered with Blue Jacket client Tony Gordon to show Gordon’s journey from incarceration to where he is now through a photo series. There’s probably a reason why things happen the way they do, photographer Stephen Perfect says. It all began when he had procrastinated on picking his partner for Artlink’s "Second Chances" exhibit and live auction, which opens today. Each artist had selected one of 13 Blue Jacket graduates to be the subject for a piece within the show – except for one. That’s how Perfect met Tony Gordon. "I had only read a little bio of what he had been through with his addictions and his incarceration, and I have no idea what it was like for him. I know what it was like for me to break an addiction," Perfect says. "I have great admiration as to what he’s doing with his life and the opportunities that he has had with the second chance." The "Second Chances" exhibit strikes a collaboration between Artlink and Blue Jacket, which offers classes and resources to disadvantaged populations in need of employment, including ex-offenders. Several of the pieces will be auctioned during today’s opening reception. The remaining pieces will be sold through a silent auction until April 13. The proceeds will be split between Artlink and Blue Jacket. "It came through conversations that I had with a few people that Blue Jacket could always tell stories a little bit better about our graduates," Blue Jacket Executive Director Tony Hudson says. "There were so many interested artists that we felt it would be a great buzz in the art community, and I think it is." Perfect and Gordon will display a photography series of Gordon’s life after Blue Jacket and of his supporters. Gordon has written short blurbs about his life as a caption for the photos. "I think Stephen is a great guy. He’s really been patient with me, and working around my work schedule. He’s really trying to do the best he can to get the project done," Gordon says. Blue Jacket was initially a condition of house arrest for Gordon, but once in the program, he says it gave him hope again. Graduating in December 2011, Gordon knows how to construct a résumé and how to handle questions regarding his incarceration in an interview, which has helped him obtain his current job. That doesn’t mean it was easy to open up to Perfect, Gordon says. "Because of the person I am, it did take me a little bit to kind of get comfortable with opening up my story to him," Gordon says. "He ended up telling me about his background, and that kind of opened the door all the way. I could tell he wasn’t a judgmental person." Kertina McCoy says she was raised to keep what happens at home at home. Growing up in an abusive home, she harbored a lot of anger and aggression, which led to her fighting and getting kicked out of school. Working with artist Jared Applegate has been therapeutic for her, she says. "It was just really nice connecting with him, and hearing his story, and having him listen to mine," she says. "It’s probably not good to do this but, sometimes I try to forget things that’s happened in my life so it won’t make me sad and depressed. So, it was very difficult reaching in that closet and bringing out all of those things," she says. Applegate created three chalk drawings to symbolize the good in McCoy’s life, as well as the rough times. "With that, we were able to sort of piece together the story," Applegate says. "There’s a comfort zone that we reached where she was able to be more personal and share some things." Artist Derek Decker says the key to working on a project like this is finding a common ground. 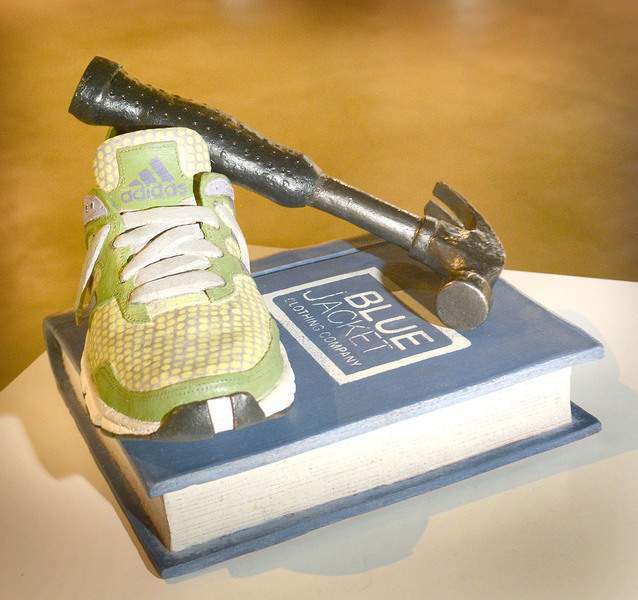 He created sculptures with Blue Jacket graduate Justin Edwards that symbolizes three phases of Edward’s’ life from incarceration to redemption. "There’s this situation where it seems like a client or the person that you’re talking to will come to a point, especially when sensitive matters come into effect, that you can kind of see the wall go up, because there is that shame and guilt," Decker says. "I had to open up my life and experiences." Edwards says a common person doesn’t quite understand the difficulties that can be placed on people in these sort of situations, which is why he has continued to volunteer at Blue Jacket. "Whenever I do anything with (Blue Jacket), I’m just trying to help people have some inspiration, get some oomph to feel like, ‘Yes, you can,’ " Edwards says. "Even though it’s difficult – and it is extremely difficult – it’s definitely possible."